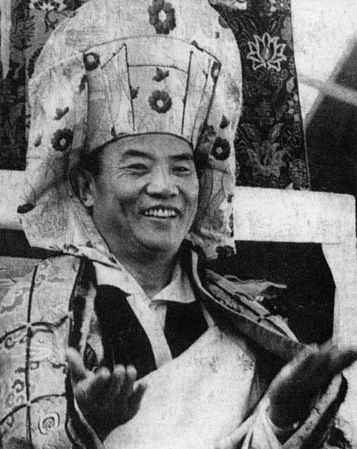 I met the Karmapa in 1976 when he was invited to a farmhouse in the Black Mountains of Wales. If there is one event which you can say changed your life, this was it. 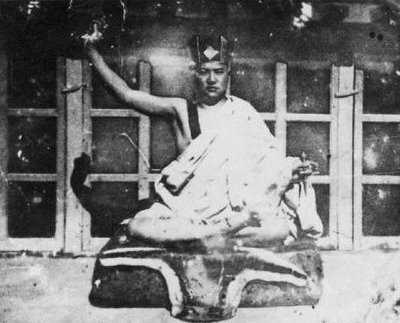 Karmapa occupied the throne completely. He had a spiritual dignity that made it his rightful seat, just as the lion proclaims his natural dominion. His eyes seemed to cover all directions and dimensions: the people crammed together bursting out the doorway into the sitting room,the house, the Black Mountains right out through space and time. One of his eyes was noticeably smaller than the other and seemed to move independently. round to look at Maggie, her face wet with tears. Time was standing still. There was a feeling of expansion, everything stretching like elastic; a sense of openness as if nothing were fixed or substantial. It was the experience of ‘the world in a grain of sand …infinity in the palm of your hand and eternity in an hour.” Compassion was a presence you could almost touch. The experience of being fully complete, of oneness, in the eternal present was mystical: Karmapa showed it to us so powerfully that it was hard to miss. ‘Words are liars,’ said Karmapa in the final line of a commentary on ultimate wisdom…. In the afternoon, Kurt informed us, there was to be an empowerment of Karma Pakshi, the second Karmapa, and I was invited to attend. It involved a commitment to the Buddhist path. In my heart I knew I was a Buddhist, but what did all these ceremonies mean? ‘What is an empowerment? And who is Karma Pakshi? And why should I go?’ I asked Jamgon Kongtrul, the young incarnate Lama accompanying the Karmapa. ’You don’t need to understand it,’ he replied beaming with great compassion. ‘Just go.’ He smiled so sweetly I felt I was with my original family at last: my tribe, people I could trust to the core. So I went. Karmapa was on the throne this time wearing a ceremonial brocade hat. He recited a Tibetan text and suddenly he seemed to transform into another Karmapa, a yogi from another life. As he got down from his throne Ilooked down at his bare feet and then up to a skullcup in his hand. He took a long handled silver spoon and poured a small amount of liquid into our cupped hands; and as he moved from one to the other of us – there were only about seven people in the room – he was dancing joyfully like a wild yogi drunk on the nectar of liberation. This entry was posted on December 24, 2010 at 4:33 pm and is filed under Teachings. You can follow any responses to this entry through the RSS 2.0 feed. You can leave a response, or trackback from your own site.